Have you ever seen life thrive while it clings to sheer cliffs that tower high over the planet’s largest ocean? 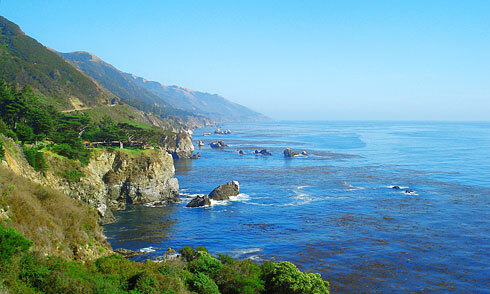 By the time I visited the Big Sur region, I’d already been in California for a few weeks, catching up with relatives in the area. And as it turned out, things worked out better than I could have planned. In all her years of living in California, my aunt had never seen the Big Sur region either, so we decided to make a day trip out of it. We made our way south, down California’s curvy and breathtaking State Route 1 (also called Highway 1), which runs along the California coast for hundreds of miles; and it came up so fast that we nearly passed up the first park I wanted to see: the Julia Pfeiffer Burns State Park, famous for having one of the only two tidefalls in all of Big Sur. (FYI: A tidefall is a waterfall that falls into the ocean.) And even before we crossed over the small bridge near the entrance of the park, we were given a taste of the visual feast to come. Later on, we realized we could have parked just beyond the bridge, as we saw some other people do, and avoided parking in the (rather expensive) parking area nearby. After all, it’s legal to park on the side of the road, so when you visit, you may want to check to see if any parking is available just beyond the bridge near the entrance of the park. To reach the lookout point, you walk through a tunnel that leads under the bridge you just drove over before you parked your car. At the end of the tunnel you can go south or north, left or right. 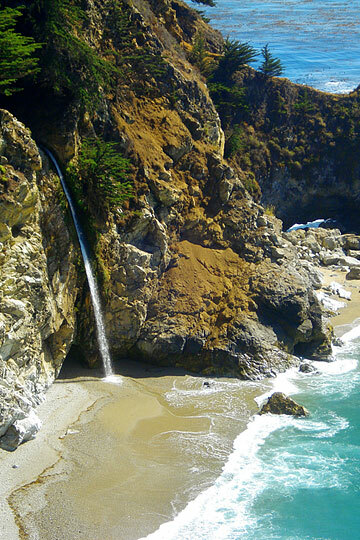 I opted to head north first, down the Waterfall Trail to see McWay Falls in all its glory. The trail itself was etched into the side of the hill; and far below me, the blue sea churned and crashed into rocks lying in the middle of the bay below the falls. I wished I could go down to the beach, but because of the sheer cliffs, there was no way to get to get down without climbing gear. When I reached a vantage point, I noticed a small blue bird sitting perfectly still, perfectly calm on the wooden fence that was the only barrier between me and the seething currents below. The bird didn’t seem concerned about the seething currents below, or anything for that matter. Instead, it preened itself for a moment, and then looked out to the falls. This bird must have been very used to dealing with humans by now. I approached slowly, and when I was only about one meter away, it still stood there, utterly failing to raise the slightest suspicion towards me. So without even using my camera’s zoom lens, I was able to get this gorgeous close shot of him. And as I continued on, the bird still remained there. When I reached a more favorable vantage point and looked out at McWay Falls, I became speechless. 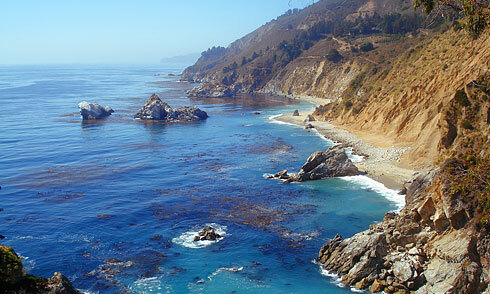 I’d seen many photos of McWay Falls before. Heck, I’d even used a photo of the falls as my desktop wallpaper for weeks at a time. 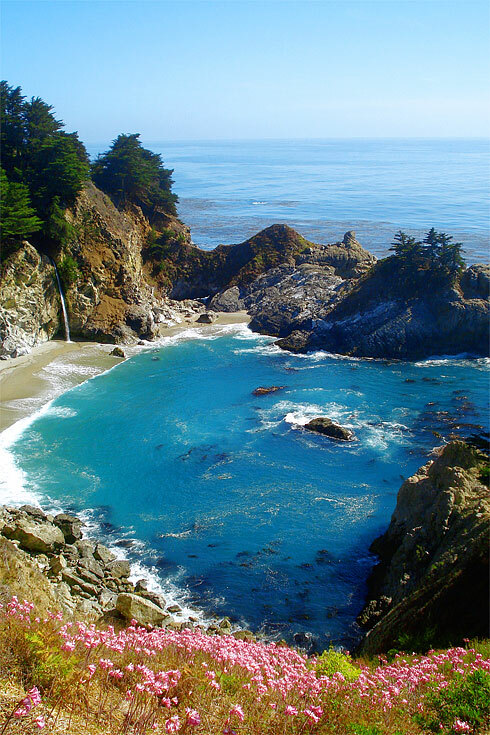 But obviously, even the best photo pales in comparison to actually seeing it, which is exactly why you should consider making time to visit Pfeiffer Burns State Park the next time you go to the Golden State. As you can see from the above photo that I took, this tidefall is absolutely beautiful. The water crashes onto the beach just a few meters from the Pacific Ocean, and the entire scene seems so picturesque almost to the point of being deliberately designed. But the photo above is just a miniscule slice of the whole picture. Sure, the falls themselves are beautiful, but behold how much more extraordinary the scene is when you take it all in at once. I didn’t know it at the time, but that day was my 110th day on the road, and I was about to see what was perhaps the most incredible natural beauty I would see in my entire 150+ day journey. 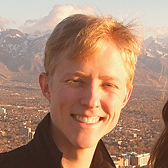 At the time, I had no idea this photo would be The One. But the way everything comes together in this picture (the warm tan rocks by the falls, the cool blue bay, and the magenta blooms at the bottom) results in a photo that, out of all the photos I took that day, comes the closest to capturing the dynamic and rare beauty that is within the Julia Pfeiffer Burns State Park. If you haven’t figured it out already, I’ll say it now: The sheer radiance of this place will blow you away. McWay Falls, while being the favorite bit I saw that day, is definitely not the only stunning sight you can see at the Pfeiffer Burns Park. As I continued to follow the right-hand path, I came across some spectacular vistas of California’s rocky coastline as it stretched north. These places are on postcards for a reason. In my explorations of the trails, I even tried to reach the falls itself and take a picture from the top if it looking down, but such a trek turned out to be hazardous without climbing gear. However, while I was exploring the area, I did discover a very old path behind the falls that I can only guess once led down to the beach. Except that now, between me and this intriguing path that was neatly carved into the rock, was an impassable ravine. Just beyond where I was standing was a drop off; and about a dozen meters below, water swirled around jagged rocks. But it looked as though things hadn’t always been this way. I can only guess that the path was cut off from land-access when the Brown family (who once owned this area and called it Saddle Rock Ranch) gave this land to the people of California as a state park in 1966. According to the agreement, the Brown family requested that beach access be closed off to the public so that it would remain perfectly pristine and beautiful, and indeed it has. After I finished photographing the area, I continued wandering around and was pleased to find some well-worn paths that headed south, as well. After passing a bunch of trees that arched over the path like a thatched roof, something scurrying in the sand startled me. What could it be? What if it was a venomous snake? What if the antidote was on backorder? The small something that was scurrying was actually just a small brown lizard that stood still just long enough for me to photograph it. I felt silly for being caught off guard by such a small creature. And after all this, I hadn’t even seen half of the entire park. But I’ll leave these sights for you to explore when you arrive there, and instead I’ll leave you with my favorite photo of California’s coast that I took that day. For if you visit McWay Falls, follow the left-hand path, and look south, you will soon see an incredible view of thriving trees (and even houses) that cling to life on the edge of insanely sheer cliffs towering high over the largest ocean on the planet. 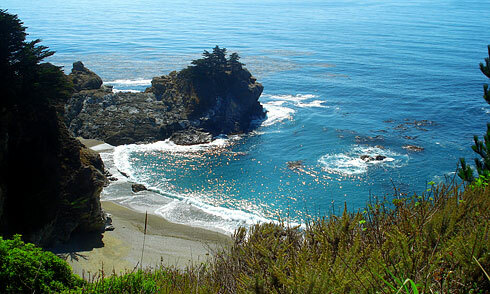 And that kind of beauty is what Big Sur is all about. 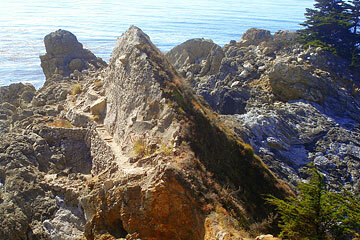 I hope you enjoyed this overview of the Julia Pfeiffer Burns State Park. As always, Marco the Spacefarer followed me and appears in each of the photos in the photo gallery that accompanies this article. 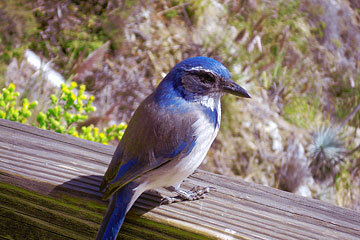 All photos from this event are in the Julia Pfeiffer Burns State Park gallery. All photos in the Gallery can be used as desktop wallpapers because they are high resolution (1920×1440). what a gorgeous place!!! your camera colors are wonderful and you writing talent is great! i want to go there! i keep looking at these photos and can’t believe it’s real….